Folks around BrainLazy HQ know that I’m not a board game fan. In fact, I severely dislike board games to an almost pathological and unreasonable degree. I may have established this in the past right here on this very site. 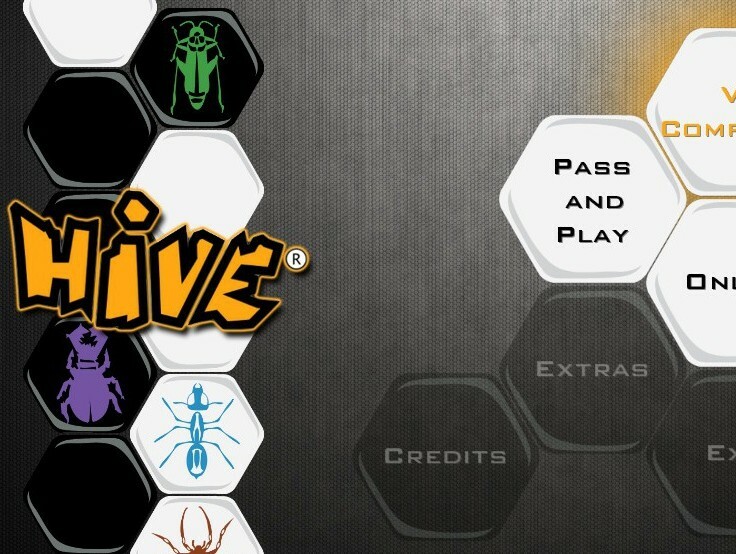 Today I’m reviewing Hive, board game that sneakily got through my radar by not using a board. Let’s see how it fairs in this uphill battle. When doing a conversion of a board game to a digital format, your job is fairly straight forward. We’re talking about a medium where every item already had to be designed and physically exists. In the case of Hive, things are simplified even further by the aforementioned lack of a board. 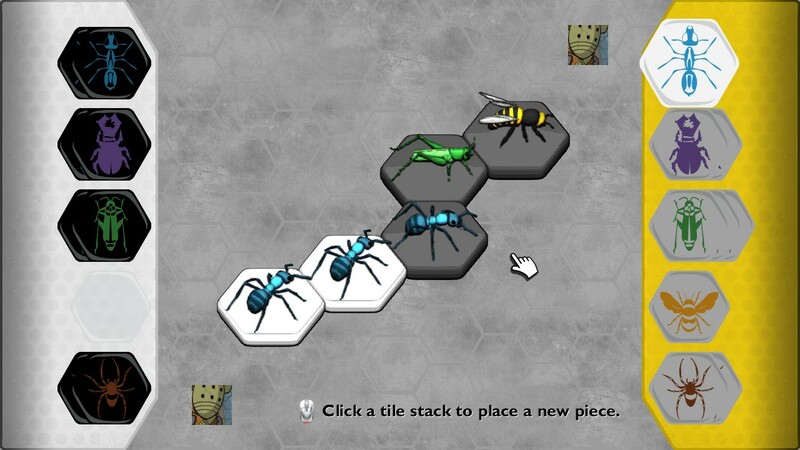 As the name would suggest, the game has an insect theme, providing you with pieces representing soldier ants, beetles, grasshoppers, spiders, and a queen bee, each sitting on a hexagonal tile. Since each type of insect (or spider) moves in its own way, quick identification is useful, and the artists were kind enough to not only make them visually distinctive through their shape, they also color coded them. Handy! 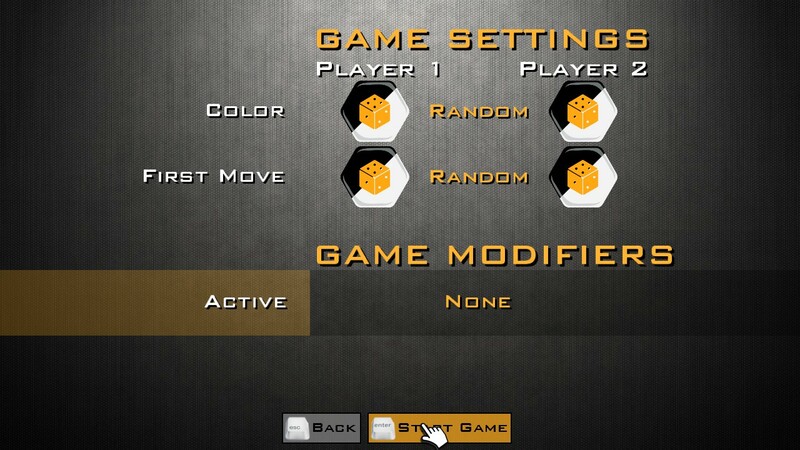 The UI is easy to navigate, carrying the hexagonal honeycomb theme throughout. When selecting a piece to move or place, the game plots out all legal positions so you don’t need to work things out on your own. The insects (and spiders) don’t really animate as such when they move, but there are appropriate motions, like the hop of the grasshopper. 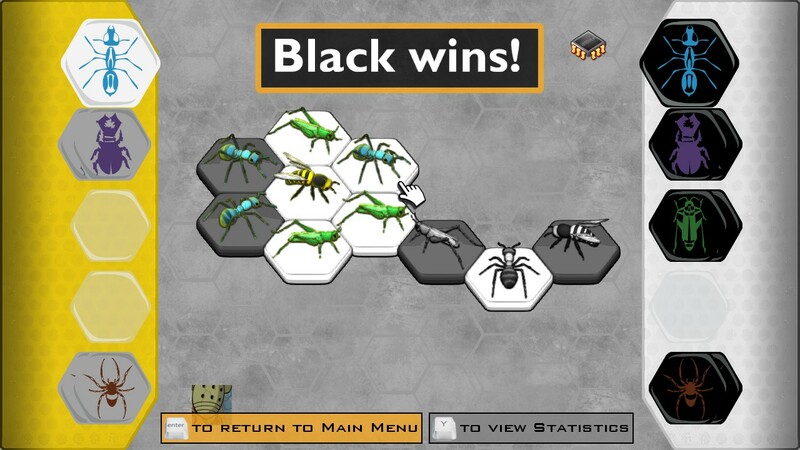 The fact that the insects (and spiders) all pivot to face the queen bee when it is introduced to the board is a nice touch. It isn’t a graphical tour de force, but overall it’s a solid visual experience. The only complaint I could offer is a single graphic glitch: the disappearance of the queen bee from her tile when the beetle walked over her. I like how they are all staring at the blank tile. 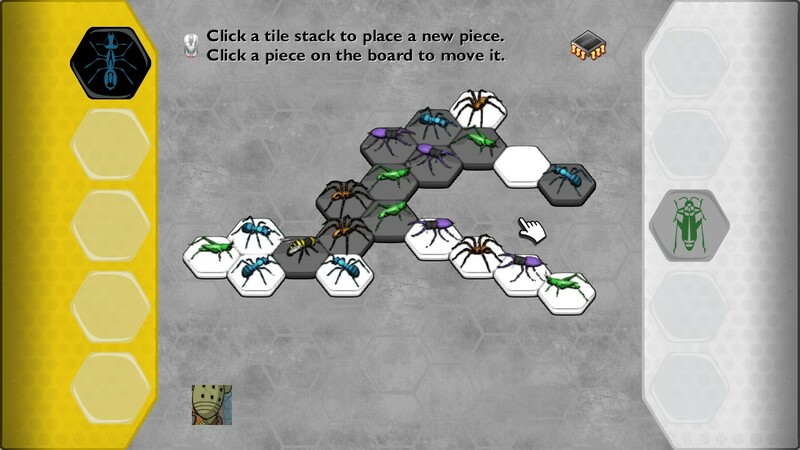 If I were to attempt to encapsulate Hive in a single sentence, I would call it insect (and spider) themed chess on an entirely free-form board of the player’s design. Each of the piece has its own way of moving. The queen can move one step in any hexagonal direction, so long as she’s bordering another piece. The soldier ant can move any number of steps along the outside edge of the play area. The beetle can move like the queen, plus it is able to move on top of other pieces, the grasshopper can jump across to the other side of any row. 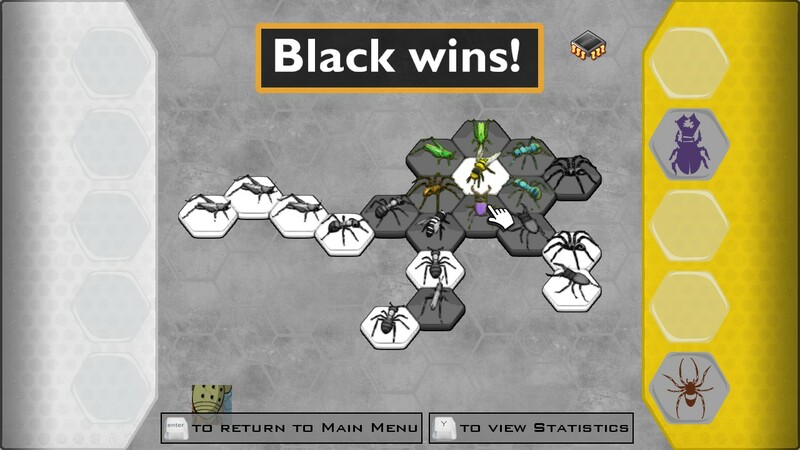 The spider is the knight of the group, able to move exactly three moves along the edge of the board. The game progresses until no one can move or until one or both of the queen bees are surrounded by pieces (friend or foe). There are only a handful of rules to the game. The foremost is that there must always be a contiguous hive. This one rule controls almost all moves and placements, and allows you to control the moves of your opponent. Here’s how. Let’s say you place a grass hopper on one side of the board, opposite the nearly surrounded queen bee. You can move another piece behind the grasshopper. Now that the grasshopper is the only connector between your piece and the rest of the board, it can’t move. Nifty! The game is played by alternately placing down or moving pieces, thus building the board as you go. I cannot stress enough how strange and novel it is to have the pieces themselves define the board. In just about any classic board game, the position of your pieces has always altered and controlled how other pieces move, but it was more because of the individual players not wanting to lose those pieces. Here, pieces can’t be lost, and the control is more direct. It allows for some fairly complex strategy. Hive has a few different difficulty settings, and I’m not proud to say that the second easiest (drone) was just about perfectly calibrated for my skill set. The game also allows you to play versus on the same computer (with the same input or different inputs), and online versus. I spent most of my time playing against the computer, and it was just fine. There is an option to activate tournament rules, and a new piece called the pill bug can be added via a game code, so unlike chess, the game is actually expandable. There are bug noises, and the music is a tribal sort of marimba and pan flute tune that is now running in a continuous loop in my head. Take that as you will. No story as such. This is a board game in the same vein as chess or checkers after all, so you’ll have to come up with your own motivations. In my case, my queen bee lost her hive to hive collapse syndrome, but she was such a powerful orator that she was able to recruit an entirely non-bee retinue to support her in her search for a new home. This was complicated by her almost crippling claustrophobia and xenophobia, two handicaps which are ruinous for a hive dweller. Nonetheless, she soldiered on until her twin sister showed herself. With her own villainous charisma, she too had gathered an entourage of insects (and spiders) and plots to stop your heroic plan to rebuild, even at the cost of her own life. … Sorry. NaNoWriMo was less than 10 days ago, and the imagination is still a little hyperactive. Keeping in mind my ironclad loathing for most board games, I must say that there was something intriguing about Hive. It is engaging, leveraging the “simple rules + unlimited variation” equation that makes for a “come on, best two out of three” experience. 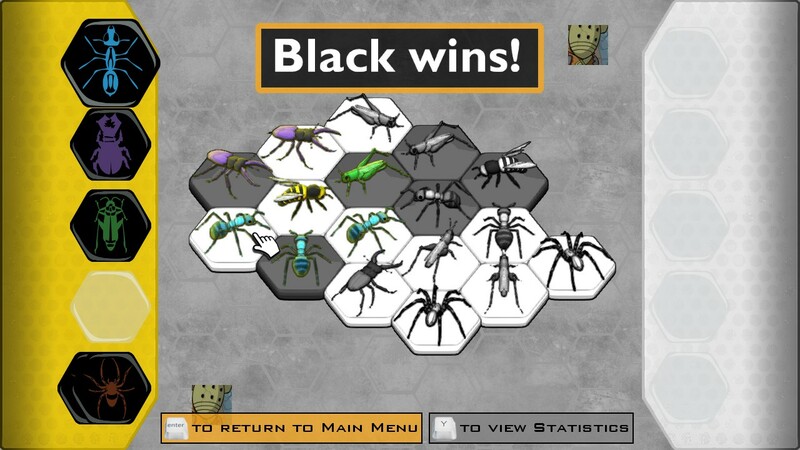 I could see carrying around a bag of bug tiles and getting hooked on a game like this. I’m pretty sure it was removing the board that did it. 8.0 / 10: Hive is an elemental, insect (and arachnid) filled game that belongs on the list with chess as a supremely simple and yet endlessly strategic test of wits for those with a taste for such things.